Wonderful beaches, crystal clear sea and lots of culture. This and more is Corfu, one of the most loved Greek islands, and chosen every year by many vacationers from all over the world. Let's start with a presupposition; the island, after Kefalonia, is the largest in Greece. Therefore, it is humanly impossible to think of being able to visit all its beaches, inlets and small bays. We will try to show you those we tested, and, those of greatest attraction of the island based on the opinions and advice of friends. 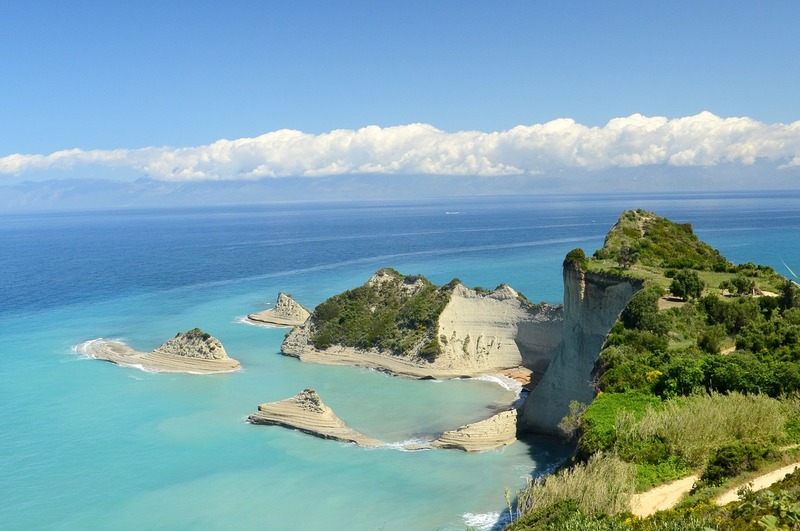 Surely, from this list, will miss the beaches of Corfu that some would have judged worthy of attention. To satisfy everyone is almost impossible: to you, the sentence! Wonderful and long stretch of sand less than 20 km southwest of Corfu Town. 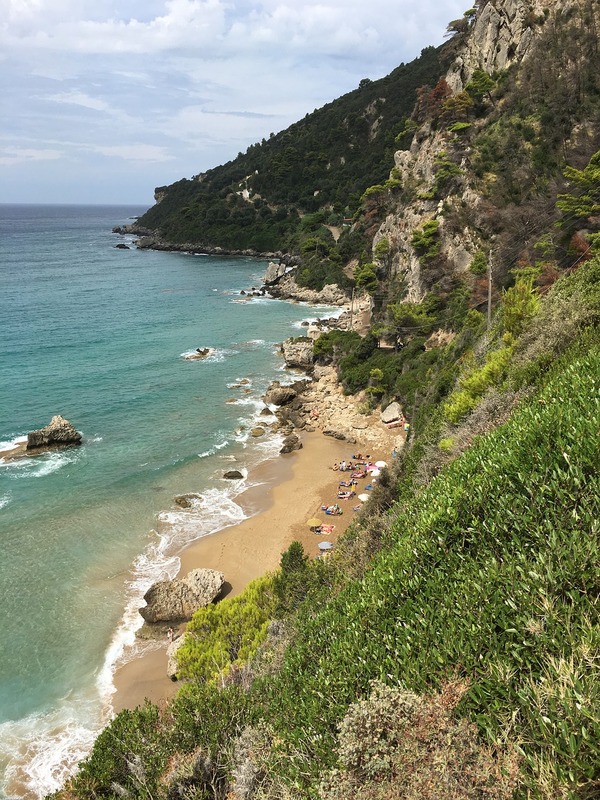 The beach of Agios Gordios is quite long, consisting mostly of fine sand, with shallow water, suitable for those who like to take long walks by the sea, and families with children. 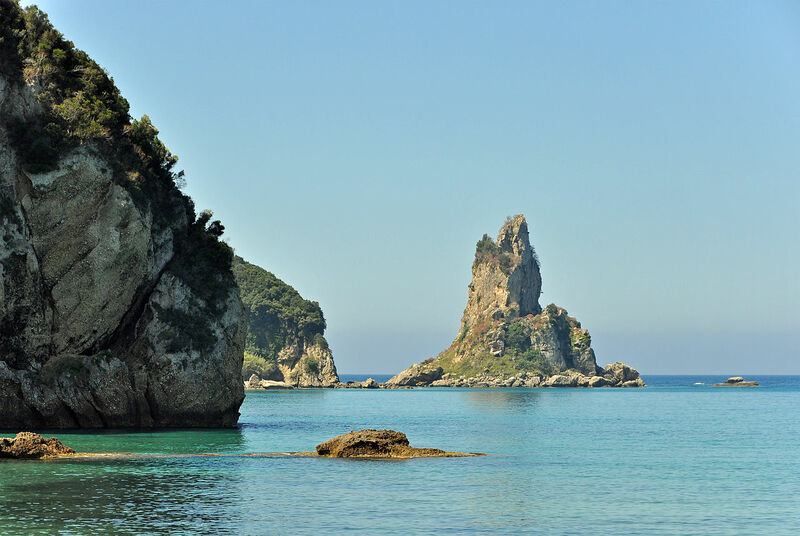 It is one of the largest gulfs in all of Corfu, as well as a particularly equipped beach. Do not miss during your visit Corfu. In the bay, at the southern end, is "Ortholithi"Or a huge rock that emerges from the water. It is accessed through two different routes from the capital; choose the panoramic road that goes up the hill, from which you can enjoy picturesque views over the beautiful bay. A much loved place, also because it offers spectacular sunsets, with the sun lost on the horizon among its beautiful waters. We suggest to reach the area in the early afternoon, to stop after having a drink by the sea, or to taste some local delicacies in one of the taverns in the area; the view is the sunset will really excite you and who was in your company! Located north-east of the island, between the village of Kassiopi to the north, from which it is just 2 kilometers, and the village of Agios Stephanos to the south, this marvelous beach is not well known but of undoubted charm. Avlaki it is a long and beautiful beach of white pebbles, bathed by a crystalline sea. Little chaotic even during the high season, thanks to the light breeze that blows throughout the day, it is ideal especially during the days of heat. Equipped beach, with some tavern nearby and a large parking just behind it. Also recommended for children, provided they have shoes: the stones, not too small, could be annoying! Awarded each year with the blue flag for cleaning its waters, Men it is a splendid bay to the northeast of Corfu Town; it can be reached through the coastal road that passes through Ipsos and Dassia. A rather wide and shallow beach, characterized by the presence of sand and pebbles, and crystal clear water. It is also ideal for families with children, and for this, it is not to be missed among the Corfu beaches. The bay of Men it is located on the slopes of the mountain PantokratorasIn front of it, the view of the Albanian coasts is truly splendid. Behind the beach there is a green area where you can relax and refresh yourself in the shade of the olive trees. Located in the beautiful bay of Paleokastritsa, it is a small cove consisting of doli rocks, completely devoid of beach, with a fantastic lounge bar and pub "embedded" in a cave. Absolutely magnificent, suggestive place, where you can swim in incredible colors, with the background of the music. After a fantastic swim, or a dip from the trampoline, you can relax while sipping a drink. Cold water: it is obviously not recommended for families with children. In high season, we recommend reaching the place, in the early morning or late afternoon. Except for the end of July and the whole month of August, you will find relaxation and tranquility typical of this magical place. For more information, we invite you to consult the official website from this link. You can reach La Grotta by land, using the main entrance from the E024 road of Paleokastritsa, or by sea with one of the taxi-boats from the bay. Located about 30 km southwest of Corfu Town, it is a place to discover, especially suitable for young people and all those who love windsurfing, because it is particularly windy. It is a long sandy expanse with dunes, which overlook between the sea and Lake Korission, the salt lake behind. From a small fishing village, in a very short time Kassiopi It has become one of the most developed tourist spots of the island, with the small village dotted with souvenir shops, bars and taverns, and its beautiful beaches, both beautiful and, at the same time, quite different. The first, located to the left of the village, very deep and particularly equipped: you will find deckchairs, umbrellas and showers. Moreover, the country is behind and offers every kind of comfort. The second, however, located behind the promontory, smaller and quieter. Crystalline water. Kassiopi is located northeast of Corfu Town, reachable through the coastal road in about 35 minutes by car. Quiet beach located north-east of the island, facing the Albanian coast, a few miles from here. Transparent and crystalline waters, with nuances of emerald green and small white pebbles, characterize this beach, which is not very touristy and therefore not very crowded. Good solution between the Corfu beaches. It can be reached via the coastal road, in less than an hour's journey. Liapades is a small fishing village, at 20 km northwest of the capital. From here, following the signs for the beach, a small winding road, full of stones and not very easy, but with an evocative view, leads to this little pearl of Corfu. Rovinia Beach It is a small beach of white sand alternating with small pebbles, and set between cliffs and a beautiful promontory. The water is wonderful, crystalline with different shades of color. The hard way to arrive, is paid off in a sublime way: do not miss it, even for the enormous tranquility, especially far from the highlight of August. It can also be accessed by sea, with special taxi-boats that depart from the nearby Paleokastritsa. As the billboard at the entrance to the street says, no pets are allowed. Less than 20 km west of the capital, this beautiful beach offers glimpses and really beautiful views from the journey, with the asphalt road that, from the cliff, leads to the bay below, giving breathtaking views and beautiful sunsets. It has a rocky coastline of crystal clear water. It is not a fully equipped place, so bring everything you need with you. It is rather quiet, and a favorite destination for nudists among the beaches of Corfu. Glyfada, A short distance from Mirtiotissa, is one of the most popular beaches for families and children for the presence of the sandy bottom that slopes gently. Equipped and with some tavern nearby, do not expect the tranquility of the previous one, especially in high season, because it is one of the island's busiest beaches. It is advisable to arrive early. There is no one who has gone to Corfu, who has not spent at least one day in Paleokastritsa, considered by many to be the beach of Corfu par excellence. Located about 20 km from the capital, is one of the most beautiful and spectacular views of the island; presents 5 several small bays and 6 inlets, consisting of sand and gravel, with crystalline water, and whose colors fade from turquoise to emerald green ..
Legend has it that here Ulisse landed. An advice: take the small road up to the splendid monastery, which dominates from the top of the hill. From here, you will enjoy an absolutely spectacular view across the bay (picture above). Obviously, if you are lovers of tranquility, keep in mind that being the most touristic place on the island, you will have to make your way through the sea of ​​people present, especially in August. It is among the most popular Corfu beaches. Come early to guarantee yours ... place in the sun. Keep in mind that throughout the area the water is particularly cold, even when the outdoor temperature exceeds the 35 degrees: this is due to the presence of numerous springs in the area. One of the bays and inlets of Paleokastritsa, really very impressive, can only be reached by sea. Surrounded around by high cliffs overlooking the spectacular sea, with a beach of small white pebbles. The water is quite cold and, above all, it is from the beginning, rather deep: not recommended, therefore, to children. It is truly a heavenly place, and one of the Corfu beaches not to be missed; to be avoided, however, during the month of August, with the go annoying and continuous of boats. Until mid-July and, from September onwards, guaranteed spectacle and suggestion. Do not miss this time! Sidari is the area to the northwest of the island, just a little more than 35 km from the capital. It is a long stretch of light, rather equipped sandy beach. It consists of three main beaches: the most tourist, which runs through the village of the same name, a small, quiet bay with rocks smoothed by the wind, and finally a third, better known as the Canal D'Amour. It is an authentic masterpiece of nature, created by the wind and the incessant waves of the sea, which have polished the rocks, giving life to an absolutely unique setting. The name derives from a legend according to which, the couples who swim through it, will remain forever in love. You can reach this beach by following the signs for Sidari and, subsequently, Peroulades; just passed, on your right, you will find inconspicuous indications that indicate the Channel. This is a fairly quiet place, except for August, it is rather small with only two rows of umbrellas and deckchairs available on site. Do not arrive late, otherwise you will hardly find a place.